Disneyland Resort Hotels each have uniquely-themed swimming pools and recreation areas that are the perfect fit for every family member. 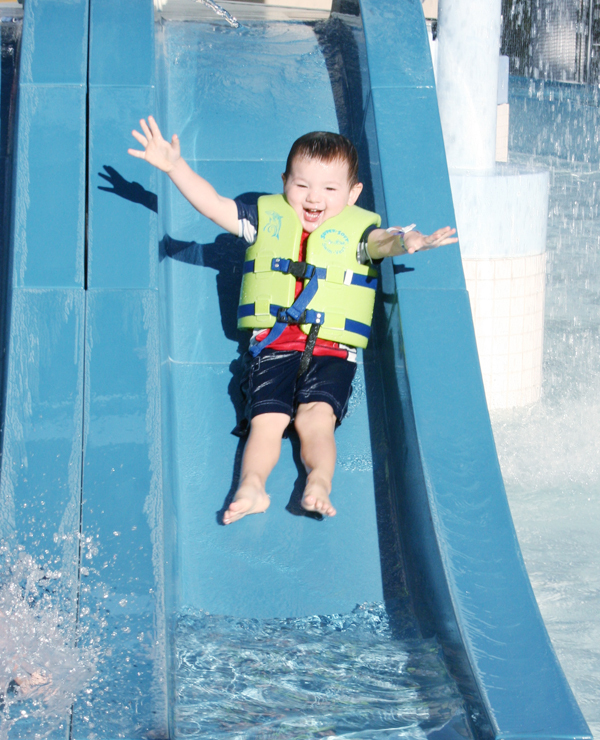 There are splash areas for toddlers, speedy water slides for the more adventurous types and warm, bubbly whirlpools for those who just want to relax. Including the creative theming, each Disneyland Resort Hotel pool offers a little something different. The Disneyland Resort Hotel pool areas are excellent for an entire day of entertainment on an off-day from the Parks. Looking to make a splash at the Disneyland Resort but aren’t sure what to expect of the pools at each hotel? Each of the uniquely themed pools at the Disneyland Resort offers something different with enjoyable details for each person in your family. There are so many reasons to stay at a Disneyland Resort hotel. But for me, Disneyland Resort Hotel swimming pools are reason enough to choose to stay onsite for my Disneyland vacations! 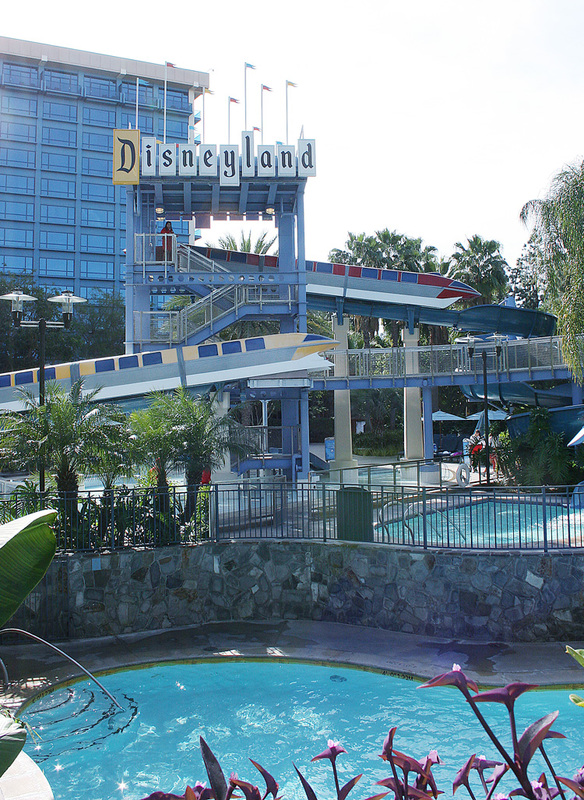 But there are a few things you should know before jumping in the pool at the Disneyland Resort Hotels. 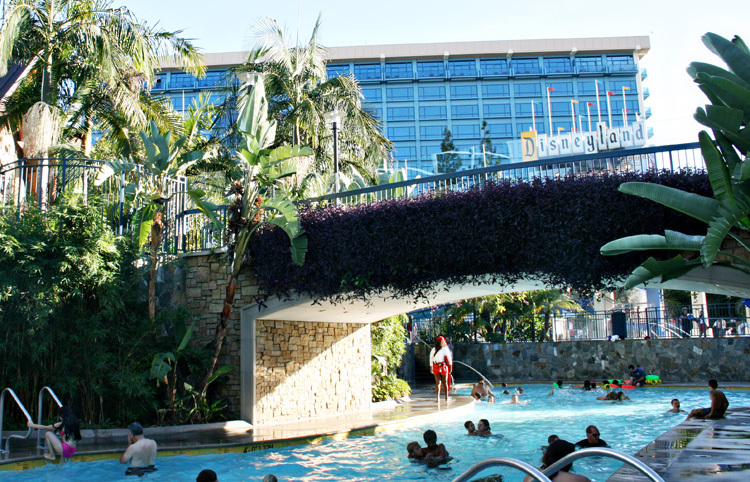 Thanks to the beautiful weather in Southern California, the pools of the Disneyland Resort hotels are open year-round. They are also heated to a comfortable 82 degrees. Be sure to check with the front desk about Disneyland resort hotel pool hours. During one of my off-season Disneyland vacations, the pool didn’t open until 10 a.m. Typically during warm weather seasons, you’ll find that the pools open as early at 8 a.m.
Keep in mind, there is no “pool hopping” allowed at the Disneyland Resort hotels. You’ll need your active room key to open the gate at the hotel in which you are booked. Only Disneyland Resort guests may use the pool facilities. Just click this picture to check out their ticket prices. 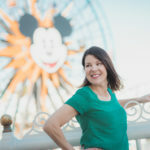 TravelingMom has partnered with Get Away Today for the best Disneyland travel deals. For more Disneyland travel tips on a budget, see 5 Little Known Ways To Go To Disneyland For Cheap. Read on for more insider details and tips about what you need to know about each of the pools at the Disneyland Resort hotels. With the striking backdrop of the hotel, the pool area at Disney’s Grand Californian Hotel & Spa is an elegant and beautiful respite that offers a very natural and “woodsy” feel. There are three pools here, including the Fountain Pool, Redwood Pool and Mariposa Pool. The Redwood Pool is the one that my children spent the most time in on our visit because of the water slides. There is a short slide at one end for younger kids as well as a 90-foot-long water slide that curves around the giant stump of a faux redwood tree. This slide certainly sets the tone and theme for this location! With the kids occupied for a while, my husband set off for one of the whirlpool hot tubs to relax. On the afternoon of our visit, every chaise lounge was taken. Fortunately there are rock walls along the perimeter of the pool area where I was able to sit in the shade and watch my kids descend the water slide. Not quite as comfy as the lounge chairs looked but I would venture to say that if we’d arrived earlier in the day we could have secured a cushy chair in the shade. For dining poolside, White Water Snacks is nearby so guests can grab a sandwich or a snack. I appreciated the sophisticated details here, like the butterflies on the entrance gate, artisan-crafted turtle fountain and the large potted floral arrangements. The ice water and cups set out for guests to enjoy were a nice touch. 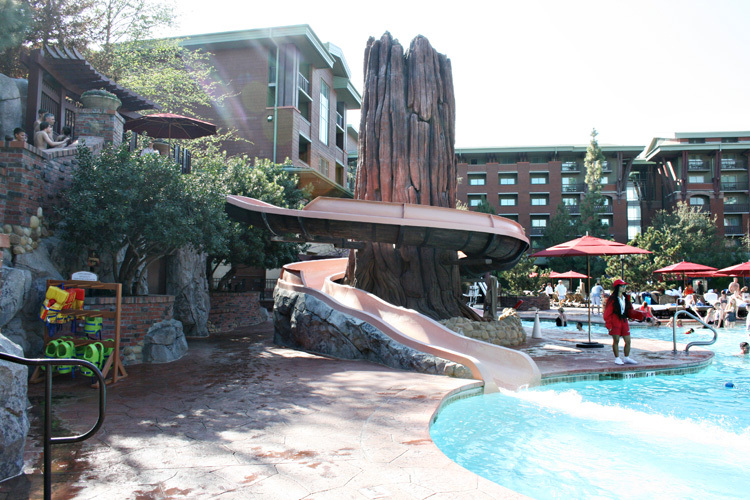 While Disney’s Grand Californian Hotel & Spa is the most luxurious of the three resort hotels, the pool area was still a comfortable place to relax. The third-floor pool area at the Paradise Pier Hotel offers amazing views and more! We’ve stayed here many times and my big kids enjoy going back and forth between the Paradise Pool and California Streamin’, their classic water slide. I find the single pool to be pretty standard and lacking in any theming. 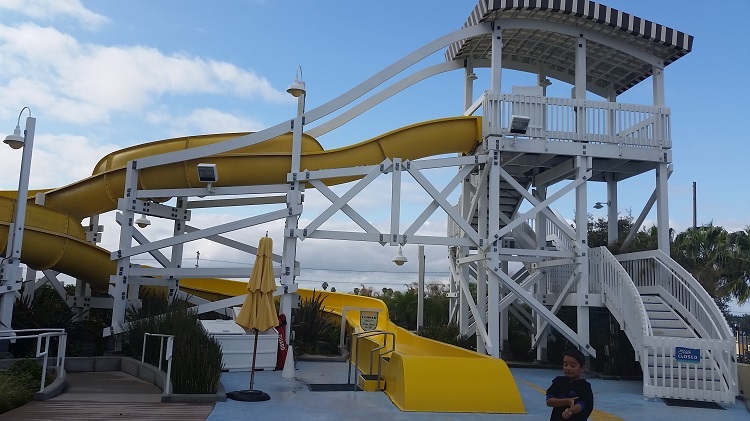 The water slide at the Paradise Pier Hotel is the highlight here and often has a lengthy line. I do like that younger guests can ride since it splashes down into a shallow, enclosed space rather than a larger pool of water. My littlest one likes dipping his toes in the shallow Children’s Pool. There are chairs encircling this space which makes it perfect for tiny tots to splash close by watching parents. And of course if you just need to relax, the Paradise Spa whirlpool hot tub is available here. The Sand Bar offers outdoor dining, though they’ve never been open on the times/days we’ve visited. That’s something to keep in mind if you like to nibble poolside, so ask first at Guest Services. Though theming is light in this area, it’s one pool area that really draws guests into the Disney spirit once night falls. Return in the evenings and you’ll see that the pool area sparkles at night as well! You can view the Disneyland fireworks show from this roof top space. Choreographed music is piped in over the loudspeakers. I’ll admit that I saved my favorite for last! 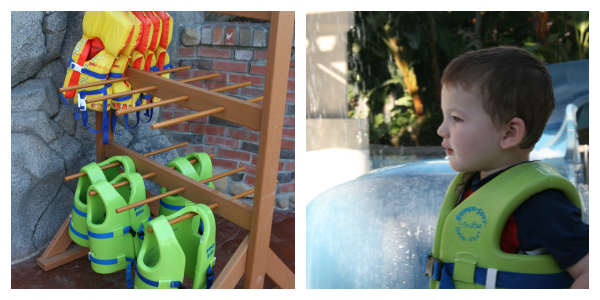 Spending time at the Disneyland Hotel pool area is always one of the highlights of our vacation memories. We have spent many afternoons here swimming under the sun or relaxing in the warm whirlpool. There is truly something here for everyone. Grown-ups enjoy soaking in either the Mickey or Minnie whirlpool spas. 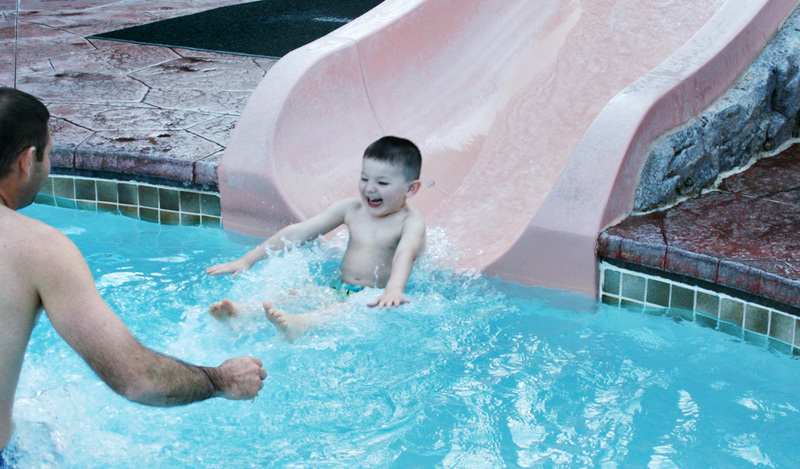 Big kids can swim laps in the E-Ticket or D-Ticket pools. And you’d be hard pressed to pull preschoolers away from the Monorail Pool! Two large water slides (180-foot-long and 80-foot-long) make a big splash and are replicas of the original Mark 1 Monorail trains. The 2-lane mini slide is perfect for little ones who love to splash in the zero entry pool area with pop jets, fountains and a waterfall. For my family, with children in a range of ages from toddler to teens, it can be a challenge to keep track of everyone in this sprawling space. There are stairs and a bridge that separate the water slide area from the pools, making it difficult to see from one area to another. Choose a “home space” lounge chair so that older kids can check in frequently. The Disneyland poolside menu has a tropical twist with two dining areas located near the Disneyland Hotel pool! Poolside service and drinks are offered from the Trader Sam’s – Enchanted Tiki Bar during certain times. We have also picked up food from Tangaroa Terrace and enjoyed our lunch on a chaise. The retro-theming of this swimming space is the most heavily Disney-influenced of all the Disneyland Resort Hotels. From the Disneyland marquee (that lights up and glows beautifully at night) to the replica monorail water slides, this is a whimsical and lively place to spend the day. What Can You Expect Poolside at the Disneyland Resorts? The pools at the Disneyland resort hotels are heated to 82 degrees. There are nearby bathrooms at each resort pool, with showers outside for rinsing off. Towels are supplied poolside, so no need to bring one from your hotel room. Lifeguards on duty at posted times. They will often remind children about walking and not running and to follow the rules of the pool. For babies and toddlers, there are swim diapers provided as well as life jackets. I always put a life jacket on my son, even though he knows how to swim because the hotel pools can be a bit more crowded. Pools and whirlpool tubs offer accessibility services for all guests. Pools can be subject to closure during the day for cleaning (or if a guest has an “accident”). In our experience, the resorts have never closed all the pools at the hotel at the same time and guest can easily move from one pool to another during closure. Pool Parties are offered seasonally at different times (depending upon the resort). Families can enjoy an hour of hosted games, music and dancing. Check with the Resort hotel guest services for more information. 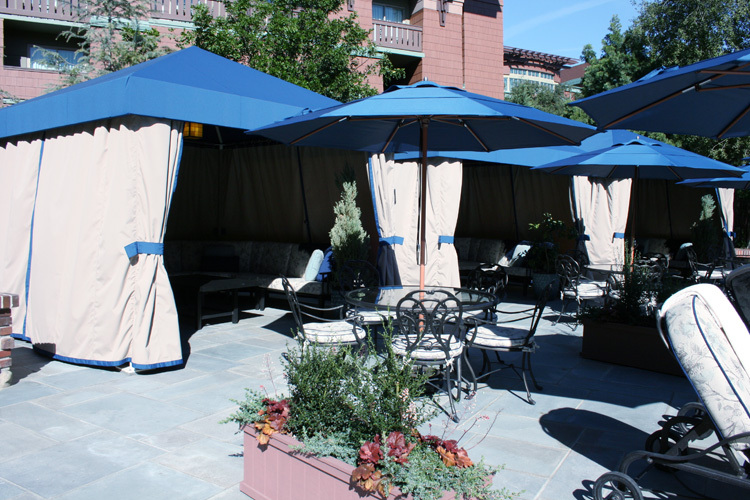 Private poolside cabanas are offered to guests staying at Disney’s Grand Californian Hotel & Spa or the Disneyland Hotel. If you’re trying to maximize the poolside relaxation, you can rent one of these luxurious cabanas for either a half or full day. Each cabana includes cable television, mini fridge with bottled water, complimentary fruit platter and shaded lounging space. A cabana server will also be available to take your food and beverage order. What is your favorite part about the Disneyland Resort Hotel pools? Share with us in the comments! If you are staying at one of the hotels, can you visit the pool for another hotel? 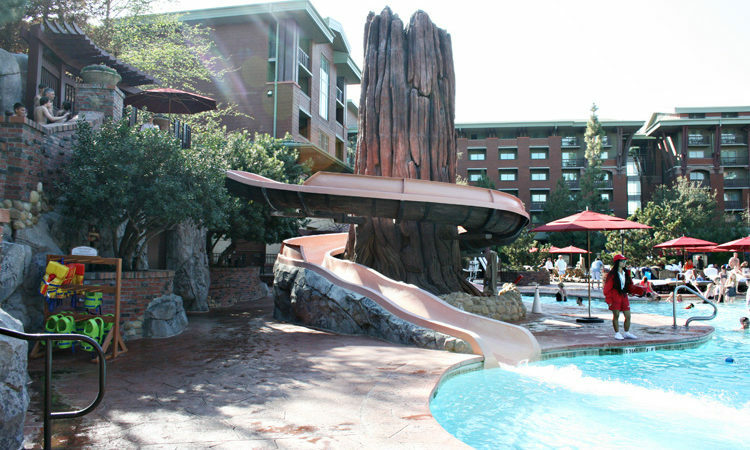 I was thinking about staying at the Grand Californian for its proximity to the parks, but think my kids would love the pools at the Disneyland Hotel. I’m pretty sure you can’t unless the pool is being refurbished. I could be wrong though, but I was told this a while back. Does the pool have flotation devices for the kids or should I pack ours? Yes, all of the pool areas have life jackets for children. Are the pools at Disneyland resorts salt water? No, they are chlorinated pools. can you sit by the pool early in the morning (not actually IN the pool) when there is no lifeguard present? I have personally walked through the pool area before it was open (you do need an active room key to enter). However I’d check with the front desk to verify this info. Which hotel would be best with teenagers? I would recommend the Disneyland Hotel for teens. They will LOVE the multiple Monorail water slides! You mentioned swim diapers were available. I assume you meant for purchase. Are they in the gift shop or on the pool deck? I have seen swim diapers available in all three resort hotel gift shops. 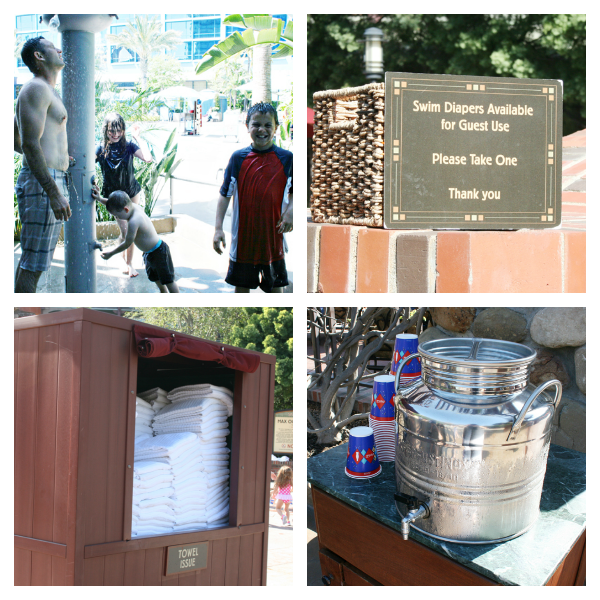 However they were also available complimentary at the Disneyland and Grand Californian pool-side. I just stayed at Paradise Pier last week and didn’t see them available at the pool here, though. Hi, I’m going to be staying at the GCH but can’t find information as to whether or not there are shallow pool areas for infants/toddlers, or any spray areas, play areas around the pool. Every photo I see looks like the pools are for older children, and I will have my 2 small grandsons with me who cannot swim yet. Any info would sure be appreciated. Thanks. There aren’t any spray areas but there are smaller pools for younger children. The hotel also provides life jackets so that non-swimmers can float in the pool safely. There are also lifeguards on duty at the pools!